Website builders like Shopify make it easy to create a beautiful eCommerce store, even if you don’t know how to code. 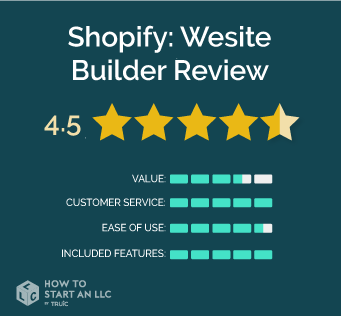 In this review, we’ll go over the details of Shopify’s web-building platform and explain how it compares to other website builders on the market. Read on to find out if Shopify is the right choice for you. Shopify is the premier web-building platform for eCommerce, facilitating over 500,000 online stores to date. Shopify utilizes a user-friendly drag-and-drop design system, offers powerful security features, and works with dozens of vendors to integrate versatile, high-quality online tools. Who is Shopify Right for? Shopify is ideal for any business seeking to launch or expand into the eCommerce space. The platform is designed to accommodate a wide range of needs, from a simple “Buy” button to a robust online store. Shopify offers the most advanced eCommerce features on the market, including abandoned cart recovery, discount codes, inventory management, and of course, top-notch security. Their theme store features tons of professionally developed, mobile-optimized website themes that users can customize to their liking. Shopify’s platform includes apps that can help you automate tons of essential business processes, from accounting to inventory management. Their customer service staff are available 24/7 via phone, email and live chat. Even with the monthly fee, Shopify up-charges for quite a few apps, themes, and other advanced services like the offline point-of-sale system. To make major modifications to your website theme, you’ll have to hire someone who knows “Liquid” -- Shopify’s unique coding language. Shopify’s services are more expensive than other comparable eCommerce packages from providers like Weebly. While Weebly’s eCommerce features are not as deep as Spotify’s, it is great for those in need of a personal website with a simple store. Who should get Basic Shopify? Shopify’s Basic package is best for sellers who are just starting out, or otherwise only need a simple set of eCommerce features. Who should purchase the Shopify plan? Growing businesses that have more complex needs, such as the need to manage sales or access certain marketing features, could benefit from upgrading to this package. Who should purchase Advanced Shopify? Advanced Shopify is best suited for large businesses with quite complex needs that would also benefit from a reduction in the transaction fee charged. At $299/month, it’s certainly a significant investment, but it’s worth it for some high-volume eCommerce stores. Who should purchase Shopify Lite? If you just need what the eCommerce community calls a “Buy” button to place on your social media or personal website, Shopify Lite might be the perfect option for you. Its price varies greatly depending on custom need and development. Who should purchase Shopify Plus? Very few companies have the need for this level of complexity, but on the off-chance that yours does, Shopify will be able to deliver. Shopify is the best at what they do, but their services are pricey compared to other providers. From committing to Shopify’s high monthly fee to paying programmers who know their proprietary coding language, costs can add up quickly. That said, Shopify’s generous collection of features can add significant value to your eCommerce business – which is why they’re able to get away with such a high price tag. When it comes down to it, the utility a high-traffic eCommerce store will get out of Shopify will make it worthwhile, but small-scale online businesses may not be able to justify the costs so easily. If you’re not totally certain that you’ll be catering to a large audience, we recommend checking out some other less expensive web-building platforms. Shopify offers 24/7 support via phone, email and live chat. Frankly, when it comes to online customer service, it’s hard to expect much more. Shopify is decently user-friendly compared to competing web-building platforms. It doesn’t require any coding knowledge to build a Shopify site, and all the apps and widgets are fully integrated into the platform. On the other hand, some users complain that Shopify’s design and functionality offerings are somewhat limited, especially for folks who are hoping to avoid paying for premium features. Ultimately, it can be difficult to build a top-level site without paying for extra features or a professional programmer, which is reflected in this rating. How Does Shopify Compare to Other Website Builders? Shopify is an excellent platform, but as we’ve discussed, it comes with a high price tag. If you’re looking to launch your eCommerce store on a budget, you might consider using Weebly. Weebly is a powerful web-building tool that, just like Shopify, allows you to build a website without ever manually entering any code. While Weebly’s eCommerce features are not as robust as Shopify’s, it’s a great option for folks who only require the functionality of a basic online store. Shopify’s comprehensive eCommerce services are well-worth the investment for high-traffic online stores. That said, stores with low traffic may not see as much value from Shopify. If you expect to launch a high-traffic online store, or plan on scaling your existing business through eCommerce, Shopify is probably the right fit for you. From their excellent customer service to their impressive volume of features, Shopify simply can’t be beaten in the eCommerce realm.